TIbn Battuta — Shams ad-Din Abu ‘Abdullah Muhammad ibn ‘Abdullah ibn Muhammad ibn Ibrahim Ibn Battuta al-Lawati al-Tanji, to give him his full name and titles — was the greatest of medieval travellers. He left his native Morocco in 1325, journeyed to Mecca via Tunis and Cairo, toured Iraq and Persia, returned to Mecca, travelled down the east coast of Africa as far as Tanzania, and returned to Mecca by the overland route across Arabia. Thence he went to India via Asia Minor, the Black Sea, Constantinople, and the Asian steppes of Tansoxania, Khurasan and Afghanistan. In India he spent eight years as a qadi or judge to the Delhi Sultan, Muhammad Tughlaq, and was entrusted to lead a diplomatic mission to the Mongol emperor of China. The mission ended in shipwreck off the west coast of India, and the would-be ambassador spent the next two years travelling round south-west India, the Maldive Islands and Ceylon. Ibn Battuta then resolved to a journey in a private capacity to China, during which he called in on Bengal, Burma and Sumatra. After probably some nine months in southern China he returned to Morocco by sea, again via Mecca, arriving at Fez in 1349. The following year he made a brief journey to see the Muslim kingdom of Granada. His final journey, from 1353 to 1355, was across the Sahara to the Mali kingdom of west Africa. On his return to Morocco, where he finally settled, Ibn Buttuta had visited territories that now make up 44 countries and travelled 73,000 miles: an astonishing achievement. In writing his rihla or book of travels at the behest of Sultan Abu ‘Inan, the Marinid ruler of Morocco, Ibn Battuta was aided by Ibn Juzayy, a literary scholar he had met in Granada. Little is known of the traveller’s life thereafter, but he probably became a local magistrate, and may have married again. Ibn Battuta’s rihla is a typical document of the period, packed with details that would interest his educated contemporaries, as it does historians, but remaining silent on the conduct and concerns of other classes. It tells us practically nothing about Ibn Battuta’s private life, or of the several women he married on the way. 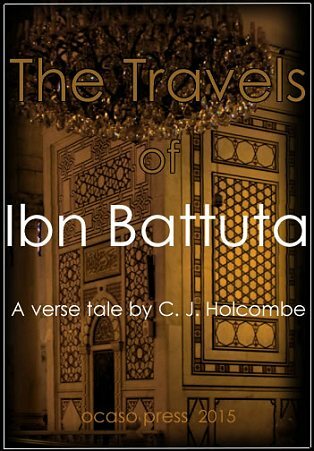 So while this poem follows the broad itinerary of Ibn Battuta’s travels, its flavour, thoughts and intimate details are very much my creation. Ibn Battuta would have taken for granted what is often explored here, and is indeed my reason for writing the poem — those issues of faith, custom and hospitality that still make the Muslim world foreign to the west. has ranged on further than these feet have trod. and favoured places that our faith can show. have talked as equal till the hour grew late. the wind-hewn emptiness of desert sand. yet others, journeying, will have no homes. to make their bloodlines rich and many-hued. there's no accounting for our different lives.